Over the last few years, Nozey Parkers have been receiving more and more calls from business owners, asking for help. They are working really long hours, they have lost their focus, and their personal relationships are suffering. They feel they’re on a treadmill and their business has become a burden. They‘ve lost that passion. Does this sound familiar? Perhaps it’s you who’s fallen out of love with your business? Think myself, as the ‘Relate’, or marriage guidance, of the business world – I’m here to reconnect you with your business and help you, and your business, thrive again. I want you to close your eyes, just for a few moments, and think back to when you first had that idea of starting your own business. You‘re the boss. You can take time off when you want and work the hours that suit you. You have control over your future. Can you feel that excitement… the enthusiasm? Of course it was a little scary, but you had made that decision and your business was born. to the sales, networking, and digital and social media skills you acquire. You don’t mind putting the hours in, because you love your business. It’s a bit like a new relationship, where you put in loads of effort. You have that drive and passion for the new business. But it’s all too easy to let the passion slide. Almost 30 years’ experience has shown us that problems start when people work ‘in’ the business rather than ‘on’ their business. You’re trying to do too much and take on too many roles. You no longer have the time to ensure customers are happy. You aren’t following your business plan. You haven’t enough cash to pay your suppliers and your team isn’t motivated. You’re work long hours, just fire-fighting. Your business feels like a chore. You’re putting things off and would rather surf the net than sort out that IT problem. You are so engrossed ‘in’ your business, you can’t escape the chaos and take your business forward. And you need help. This help could be in the form of a business advisor, like myself, or an HR, sales or marketing specialist. Getting outside help can channel you in the right direction. Someone else can do the work you don’t like doing, or which takes up too much time. This gives you more time to do the things you love and you’re good at, as well as time to work ‘on’ the business. Talking to a business advisor will remind you ‘why’ you’re in business, who you help, and explore new direction, goods and services. 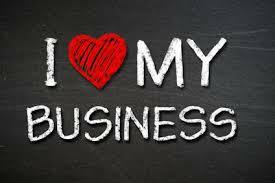 You loved your business when you started so you can love it again. Examine your life. Look at a typical day, week and month. Work out where you’re spending your time and money. What’s important to you? Get the balance right between your work and personal life. Gain some control and direction. Put good systems, processes and procedures in place. This frees up your time and helps other to share the workload. Tasks can take half the time with the right processes in place. I’ve helped many businesses by streamlining their infrastructure, which in turn takes away the feeling of being overwhelmed and out of control. Follow your business plan, ensure you track customer and staff satisfaction, don’t procrastinate, and look after your cash flow. Make time every day to remind yourself why you started your business. List what it gives you in terms of satisfaction and freedom. Think of this as spending important ‘quality time’ with your business! Create good support networks within your team, professional groups, friends and family. Running your own business can be lonely, but it shouldn’t be, and having this support can make the difference to help you succeed. If you have lost that loving feeling and you would like some help to rekindle that passion, then I would love to hear from you. We help business owners relax in the knowledge that their business is running efficiently and profitably, and their staff are motivated and driven. Watch our You Tube channel for video blogs to help your company grow and go to nozeyparkers.co.uk for our full range of business services and client testimonials. Today I am talking about how to get the most out of business shows. For many of us the thought of having a stand at a business exhibition is quite daunting. I regularly have stands at exhibitions for Nozey Parkers, because I know what a huge impact they can have. We raise our profile, get new leads, gather market intelligence, and develop relationships with existing clients and suppliers. Hopefully this blog will help inspire you to go to your first business show, or help you improve your return on investment. So what are my most important tips? Know why you are attending the business exhibition. Our main reasons are to gather leads, generate business and to raise awareness of Nozey Parkers and what we do. You need to measure the success of each show against your objectives. Attending exhibitions can be costly in terms of time and materials, so it’s crucial you know which is best for you and your business. Find out how many delegates have visited the exhibition before. Are they right for your business? How many exhibitors are there? Who are the other exhibitors? Do they complement or compete with your business? Could they even become your clients or suppliers? Ask your contacts and check out social media. Don’t just trust the show’s promotional material or sales patter. Ensure you know what the full costs will be. You may have to pay extra for parking, a table, electricity and lighting. Check the position of your stand. You don’t want to be stuck where there’s no footfall. Use social media, your enewsletters and website, and if possible try to include a quote from your company in the show’s own PR. You may have a product launch to promote, an ‘Ask the Expert’ session, a competition, game or offer. Make your stand and team stand out. And on the day use social media to make contact and engage, using the event’s hashtag. What you need to bring will depend on the event, and what you want to achieve. Typically you can expect to bring a pull-up or pop-up banner stand, posters, business cards, literature and free promotional goods. You are likely to need a laptop, phone and laptop charger, signage, tape or blue tack, and extension cables. If you are running a larger stand you may need sound equipment, lighting, flat panel monitors and speakers. A list will make it easier to check you don’t forget anything. If there’s too much for you to transport, there are companies which will collect, take, and even put up your exhibition stand. And don’t forget that you should allow three weeks for ordering promotional items such as bags and pens. Practise setting up your stand and check timings so that you aren’t late. Also make friends with the organisers and security staff, and neighbouring exhibitors… you’ll enjoy the event more and you might need their help! Select team members for their professionalism, knowledge and friendly approach. They should be dressed for the event, wear comfortable shoes and name badges. The most important thing is to SMILE! It’s essential you look helpful and interested. Your body language should be relaxed and always make eye contact with delegates. And here’s a list of things to avoid on your stand. Don’t sit down, unless you are with a potential customer. Don’t eat, drink, or chew gum! And don’t criticise your competitors or event organisers… it will reflect badly on you. Ensure your team is fully briefed. Do some role-play. On the day, check that team members are in the best position to welcome approaching delegates. Before the event contact your customers and prospects to invite them to your stand. Incentives could include a free gift, or being the first to learn about your new product. Think about what questions to ask delegates. You don’t want ‘yes’ or ‘no’ answers. Questions that work for me include: ‘What line of business are you in?’ and ‘what are your main reasons for visiting the show today?’. Tailor the questions to suit your organisation. In summary, it’s essential to plan the event, practise, and promote your business in a professional way. Get this right and you’ll generate business and new quality leads. Don’t get it right and you’ll have a poor return in investment and you could even damage your reputation. I hope that this helps you and your company. Go to our website for our full range of business services and client testimonials. Watch our video blogs to help your company grow on our Nozey Parkers You Tube channel. Please contact us for further advice or share your own top tips with me on social media. BUSINESS COACH, MENTOR, ADVISOR OR CONSULTANT? If you have your own business there will come a time when you will need to hire business help in the form of a coach, mentor, advisor or consultant. You may have had experience of working with some already. Was your experience a good one? If not then you may have hired the wrong one! I.e. a coach rather than an advisor. Which one will work for you will be dependent on what sort of person you are. In this blog I will talk about the differences between the four options, and explain which ones will work, dependent on how you like to work within your business. Working with a business coach it is all about YOU. What do you want out of your business? They will help you bring out the best in you and help you make the right decisions that will keep you motivated and help you take your company forward. So some things they might work on are accountability, motivation, self-sabotage, limiting beliefs, focus, fear, distraction, clarity, brainstorming, time management and vision. They help you create a vision and work with you to create a plan to make that vision come to life. They don’t have to have any real business experience. They have usually studied things like psychology, NLP, and usually have a coaching accreditation. They probably won’t come to your premises – you have to go to them. Coaches work best with people that are self-motivated and driven, and want to do everything themselves. These are usually people that have run their own successful businesses before and want to give their time to helping others do the same. It can be free to businesses sometimes. They can give you advice on what worked for them and can help with those difficult business decisions. A mentor is someone who offers their knowledge, wisdom, and advice to someone with less experience. Again, just like the coach, the mentor will not instruct your team or do things for you – you still have to do everything yourself. They work with you and your staff to make your business succeed and increase profits. They will look at the whole business and all the different elements within that business, to make sure it’s all working as efficiently and productively as it can. As they nearly always work at the clients sites with the teams, they get to see how everything interacts; the people, systems, finances and the owner. The owner i.e. you, can sometimes be what is stopping the company from succeeding. That is why business advisors nearly always get much faster results than a coach, as they can see really quickly where the problem areas are, and, if it is the owner, they can teach the staff how to manage the situation better. You’ve heard of Alex Polizzi, The Hotel Inspector and The Fixer? Well she is a classic example of a business advisor. Advisors deal with improving the whole business and look at every area: processes, strategy, planning, marketing, sales, staff, products, premises, finance, IT, warehousing, etc. They will help you to implement what is needed either by project managing or by doing the work themselves. They will all have years of real business experience that they can apply to solving problems, helping companies grow, streamlining, improving efficiencies, etc. They have dealt with your problems before so know what is going to solve them fast. If you need the support of someone being there and “hand holding” to get things done, then an advisor would be best for you. These will be specialists in a particular field i.e. HR, marketing, IT, and will advise and implement systems in those areas only. If you use a consultant you expect them to do everything for you in their specialised area. Tina Marie Parker, business advisor, has been helping businesses for nearly 30 years. From start-ups to succession planning. From companies going through rapid growth to companies desperate to see some growth. She helps them thrive and survive. Great business advice and hands-on support for your organisation, getting the desired results, fast. For many of us the thought of manning a stand at a business exhibition is quite daunting. There’s the logistics to consider, how will you attract people to your stand, what literature will you need, etc. Some of us have exhibited before and know what a huge impact it can have on our business, in terms of getting new leads, and raising our company profile. In this blog I want to summarise the important things to consider when exhibiting, and hopefully give you enough info so that, if you have not exhibited before, you might give it a go in the future. Do your research before paying out for an exhibition space. How many delegates have visited the show in previous years? Who are the other exhibitors? Where is your stand located? What is included in the price? Do you need carpet, furniture, tablecloth, a banner, lighting, signage, extension cables, etc.? Once you know where you are exhibiting and what number your stand is, promote it like mad! Use social media, your website and local press to make sure you have visitors to your stand on the day. Give people a reason to come to your stand – new product launch, a competition, pick up an invitation to an event, run a game, etc. Your literature could be a company brochure, news about new products, a special offer you are running, etc. Make a kit list of everything you need to take to the show: products, banner, posters, business cards, literature, literature holders, bin, promotional items, laptop, phone charger, laptop charger, signage, scissors, cello tape, blue tack, extension cable, etc. If you are running a larger stand then you may also need, sound equipment, lighting, flat panel monitors, speakers, etc. Having the list will make it easier to tick off, as you get ready to transport all items to the exhibition. You should always try to have a practise run of setting up your stand, before the event. This will help you to decide whether you have missed anything off you kit list! Also make sure you know how long the journey is to the show, is there available parking, etc. Some events allow set up of the stands, the night before, while at others you have to complete the set up and dismantle on the day of the show. Make sure you know when yours is and make sure you know how long these processes will take you. Who is manning your stand? Make sure you pick the right people for the job and make sure they are dressed accordingly, with proper name badges. Try to have a run though with them all about how to attract people to the stand and how you expect them to conduct themselves. Think about your footwear. Exhibitions are hard work and you are on your feet for long hours, so make sure your footwear is appropriate. Send out special invites to your customers, to visit your stand, to receive a free gift. When trying to attract delegates to your stand do not ask them a question that can be answered with a Yes or No. Ask things like: What line of business are you in? What were your reasons for visiting the show today? How many people do you employ? Who’s running the business in your absence? Tailor the questions to suit your organisation, but make sure they are able to start a conversation. Always face the aisles to see visitors approaching and greet them near to the aisles. The most important thing you can do while manning your stand is SMILE! You must look friendly, non-threatening, approachable, alert, helpful and interested. Your body language should be relaxed and you should make eye contact with the delegates. Don’t have your arms crossed. Don’t lean on the tables or counters. Don’t sit down – unless you are sat down with a potential customer in your stand. Try to refrain from eating and drinking on your stand. It can be messy and smelly, and is totally unprofessional. Have small bottles of water handy for you and your crew to drink when they can. Definitely don’t chew chewing gum! Don’t use your mobile phone while manning the stand. If you need to make a call, inform the other crew and find a quite spot elsewhere. Make sure your stand is never left unattended. Never badmouth your competitors. The exhibition is for you to promote yourself and your business in a professional manner. Planning and practising are crucial. If you have got yourself organised you will have an amazing time and will gain some great new leads. If you have not put the time in before-hand then the return on your investment will be poor, and you could damage your reputation by your stand looking totally unprofessional. Tina Marie Parker has been helping businesses for nearly 30 years. From start-ups to succession planning. From companies going through rapid growth to companies desperate to see some growth. She helps them thrive and survive. Great business advice and hands-on support for your organisation, getting the desired results, fast. I want you to think back to when you first had that idea of starting your own business. You were going to become the boss. You could take time off when you wanted and work the hours you wanted. You would have felt excited, enthusiastic, maybe a bit nervous and scared as well, but you made the decision and your business was born. Those early days are exhilarating. Every day is a new experience and steep learning curve. You have to learn how to sell yourself and your product/services, to strangers, maybe by face to face networking or via online marketing and social media. You put loads of energy into getting your business off the ground using your drive and the passion you have for your new business. It’s a bit like a new relationship, where you put loads of effort in at the start. Let’s be honest here. When you started your business you really did not have a clue about the reality of running a business. Taking time off can be difficult, working long hours, the pressure, money worries, stress. Keeping going can be hard work at times, BUT it can also be very rewarding with the right approach. Your problems started when you decided to work “in” the business rather than “on” the business. As the business grows you take on too many roles, try to do too much. You no longer have the time to make sure that customers are happy, that you are following your business plan, that you have enough cash to pay your suppliers, that your staff are motivated. You work long hours just fire-fighting. A lot of what you have to do in your business feels like a chore. You put things off and would rather surf the internet than sort out that problem with your IT network. The thing is that while you are so engrossed “in” your business, you cannot see clearly how to get yourself out of the chaos and take your business forward. You need to get help. This could be in the form of a business advisor, like myself, or a sales and marketing specialist, HR specialist, etc. Get outside help to manage the areas that you do not find easy or take up far too much of your time, then there’s more time to do the things you love. Sometimes talking to someone outside your business can help to remind you of the “why” you are in business. So why did you start your business? Who did you want to help? How did you want to help them? Is this how you still feel now? Do you want to add new services to the business? Putting good systems, processes and procedures in place can free up your time and help other to do some of the work. Tasks can take half the time with the right process in place. I have helped many businesses streamline their infrastructure and take away the feeling of overwhelm and being out of control. You need to assess your life. Look at a typical month of your activities. Work out where you are spending time and money in both your business and with your family. What’s important to you? If you feel that there should be an even split between how you invest your time and money between work and family, is this how you are operating? Try to redistribute accordingly.